Slovakia's Daniela Hantuchova has withdrawn from the Paris Open because of breathing problems. Hantuchova overcame France's Sandrine Testud in the first round but said she had been suffering from a cold. Her second round opponent, French 16-year-old Tatiana Golovin will now face second seed Elena Dementieva of Russia in the quarter-finals on Friday. Former champion Mary Pierce of France beat Spain's number eight seed Magui Serna 6-2 6-4 to reach the next round. Top seed Kim Clijsters raced into the quarter-finals by beating Spaniard Maria Sanchez-Lorenzo 6-0 6-1. The match lasted only 39 minutes. Russian Elena Bovina dispatched Serbian fourth seed Jelena Dokic 4-6 7-6 (7/5) 6-0. And Switzerland's Patty Schnyder, the third seed, lost out to Dinara Safina 4-6 6-2 6-1. 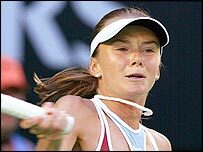 Safina also beat Schynder en route to her first WTA title at Sopot in 2002. Safina will meet Italian fifth seed Francesca Schiavone for a place in the last four. Schiavone was made to work before coming away a 7-6 (7/4) 6-3 winner against Croatia's Karolina Sprem. Former Paris champion Mary Pierce brushed aside eighth-seeded Spaniard Magui Serna in straight sets to advance to the last eight. Pierce took the tie on her fourth match point to win 6-2 6-4 after an hour and 19 minutes. Italy's Francesca Schiavone, seeded fifth, progressed to the last eight with a 7-6 (7-4) 6-3 win over Karolina Sprem of Croatia.